Some very basic information to help you with your cultural adjustment to the United States, your community, your co-workers and your employer. A very exciting and challenging opportunity is about to begin. Soon, you will be living and working in the United States as a participant in Work & Travel Program. You will be living and working side-by-side with people in theUnited States. You will be helping them learn about your country as you learn about theirs. This will be unique and enriching experience for you. Cultural exchanges are very rewarding, educational and exciting for Work & Travel participants. The information in this section will help you have the best experience possible. Cultural information, survival skills, and important tips will assist you in learning to live comfortably and be happy in a new environment. The best way to assure your success is to keep a positive attitude. The culture and lifestyles in the USare different from those in your country. It is important that you understand that there will be an adjustment period. EVERYONE who lives abroad experiences some kind of “Culture Shock” at some time during their stay. Keeping a positive attitude will help you more easily accept the differences between our cultures. SMILING is a good thing! Do it often! If you smile, people around you will smile, too. Depending on where you are living and working, some people have had a great deal of experience living and working with people from different countries and different cultures, while others have had fewer opportunities. Some people have little or no experience working with someone who is new to theUnited Statesor with someone who is not totally fluent in English. Even though you may have some difficulties, it is important to remember that you will be representing your country and that if you are able to keep a positive attitude it will help people have a good impression about your country and its people. Be patient with yourself and with the people with whom you live and work. Work environments are different in the United States than in your country. Rules for employees and the way people socialize at work are also different. The culture or way of life in one community is often very different than in another community. The US is a very large country. The pace of life in larger cities is often much busier than in smaller cities. If your hometown is a small city and your place of employment is in a large city you will see that things are somewhat different. It may take a little time to get used to the noise and activity of a big city. On the other hand, if your hometown is a large city and you are living and working in a small city, you may feel like there are not as many opportunities for shopping, sightseeing, entertainment, education, etc. Remember to be patient. It takes time to become accustomed to a new environment. The differences between your hometown and your town in the United States will be the things that will make your experience more interesting. You have the opportunity to learn about how people grow to love their hometowns whether they are big or small, in the mountains or in the country, near a beach or in the desert. Wherever you are, you will have the chance to do and see many, many new and exciting things! 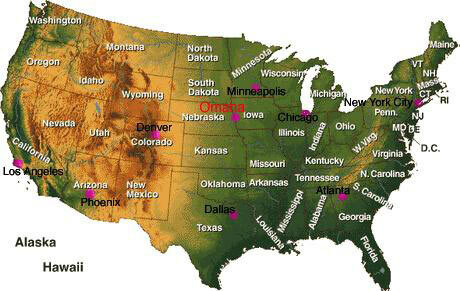 The United States is a very large country. Each area of the country has some culturally unique aspects. In fact, each state can be identified by certain cultural characteristics! For example,Florida is the “Sunshine State” andWashington is the “Evergreen State”. InFlorida the culture of the state focuses around activity in an area with sunny, warm weather and few mountains. InWashington, the weather is much more seasonal and there are many mountains covered with huge Evergreens trees. The culture of every state, community or family is very much related to the environment. You may have a friend who is in Work & Travel Program in another city or another state, or you may know someone who was once a Program participant. The experiences and memories that each student has are also very unique. Since the US is so large and diverse, it is not likely that your experience will be exactly like another student’s experience. It is important to remember that wherever Work & Travel students have been located . . . large cities or small cities, in the country, or the desert, they have been able to have interesting, exciting, and rewarding experiences. Communication will help you build a good relationship with your employer and the people with whom you work. For many years Work & Travel students have been working side-by-side with people in theUS. Other participants have experienced some of the very same things that you will be experiencing. It is important to be open about learning new ways to do things. It is important to respect cultural differences. However, it is not always easy, and it does take time to build good relationships. Sometimes misunderstandings between Work & Travel students and their employers or co-workers are simply caused by cultural differences. It is important to talk about how you feel. Generally, in theUS people like to know if you have a question, a problem or a concern. People respect individuals who can discuss issues in a polite, adult manner. They appreciate having the chance to explain why something happens or why they said or did something. In fact, “Why” is a very common question in theUS! Be respectful and considerate, but be confident enough to express what you are feeling. Misunderstandings often occur when people do not ask questions or explain their behavior. So, as you begin your Work & Travel Program, remember to smile, be patient and communicate! Most of all, remember to have fun and enjoy your experience. You are about to have a very valuable, interesting and rewarding experience. Use the information on the next few pages to begin to understand a little more about cultures in theUS, your new environment, working in theUnited States, and your new way of life. Getting to Know the Culture and People of the United States. . .